The 49th match of IPL 2018 being played in Eden Garden Kolkata between RR and KKR. KKR won the toss and opt to bowl first. This match is a must-win match for both the teams because each team has 12 points and after this match 1 will left. So this match is not only a match but do-or-die battle. As usual Joss Buttler started the inning with Rahul Tripathi. Andrew Russell got the first wicket of RR the wicket of Rahul Tripathi(27 of 15, 4 4s and 1 6s). Kuldeep Yadav got most valuable 3 wickets the wicket of Jos Butter(39 of 22, 5 4s and 2 6s), Ajinkya Rahane (11) and Stuart Binny (1), Sanju Samson(12) lbw by Sunil Narine and Krishnappa Gautam c by Kartik b by Shivam Mavi. Kuldeep Yadav got one another wicket of Ben Stocks in we 14th over. RR in trouble after 14 over 107 for the loss of 7 wickets. RR all-out at 142 in 19 overs. Sunil Narine played high voltage inning scored 21 runs in 1st over of the inning. 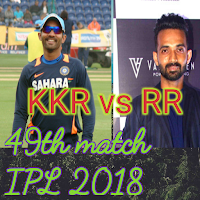 Chris Lynn 45 and Dinesh Kartik scored 41 runs in just of 31 delivery. KKR got winning target after losing 4 wickets. KKR 145/4. KKR won the match by 6 wickets.